There is lots of different options, totes, laptop bags, messenger bags are just some of the options you can choose. We have compiled a list of our favorite teacher bags; there should be something for everybody. Without further ado, let’s dive into the products. If you wish to read a bit about the two most popular types of teacher bags, you can use the table of contents to scroll down in the article quickly. Evervanz is quite a new favorite brand on Amazon; they have a big product range which features very modern and hip bags in funky colors and a unique design. This model is made from 100% genuine leather, durable and dependable horse leather exactly. The product dimensions are 11.8” height, 15.8” length and 5.9” wide. This is a very classic traditional model which you can also use in a business environment. We were very impressed with the high-quality of the leather and the hardware used on this bag. It comes with a detachable, adjustable shoulder strap so you can also use it as a classic briefcase. The whole material seems very durable and sturdy, and the brass hardware buckles are functioning as it should. It comes with a flat bottom so that the bag will keep a nice upright structure all the time. Inside the bag, it features two main compartments, one of them is a laptop compartment with a Velcro strap, and it fits up to a 15” laptop. The other main compartment is great for books, files or your lunch. It also has multiple slip pockets and zipper pockets for your organization needs. When this post was published, this excellent bag only featured 5-star reviews and more than twenty of them. It’s quite unusual, and we understand why at this price 129.99$ – this is a catch. This popular Nylon tote bag comes in a lot of different colors, teal, brown, gray, purple, red and black. It’s a very practical and stylish choice. It’s quite a large bag; the dimensions are 20” long x 14.8” high and 7.5” wide. You can use it with the shoulder strap or just carry it around like a regular tote bag. The gold tone hardware is of high-quality and the material consist of 70% nylon, 20% cotton and 10% faux. All the material is water resistant, we tried to pour water on the outside, and it was rejected immediately. The carrying handles are made from Faux leather trim and feel durable and reliable. The bag offers a lot of compartments and pockets to keep you organized. There is an exterior, easy access side pocket which is great for keys or other things you need to get your hands on quickly. Inside the bag there is one big main compartment along with a zipper pocket and multiple regular pockets, also featuring pockets specifically designed for writing material like pens or pencils. 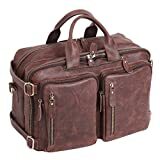 This is a great hybrid bag which is perfect as a teacher bag; you can easily fit a 16” laptop and multiple books plus reports or other files you need to bring with you. This bag is also a great weekend getaway bag so that it can serve you outside of your job too. If you’re looking for a large practical bag which is stylish and cute then you should go for this one, you will be surprised just how spacious it is. This beautiful original leather bag is crafted from 100% genuine goat leather. It’s a very vintage style bag with a very stylish look. This bag was handcrafted in India, and the stitching, hardware and the craftsmanship of this bag are just awe inspiring. The hardware is made from brass, and you can order three different dimensions of this bag, 13”, 15”, or 17”. So make sure to choose the correct one when you checkout. Since it’s genuine leather, you may experience a leather smell on this bag for the first four to six weeks, after that the smell will slowly fade away. The color of this bag will vary slightly since it is real undyed leather, and eventually you will end up with your brand own unique patina. The bag uses buckles to close the bag which matches the vintage theme of this bag beautifully. On the front of the bag, there is a pocket for quick access items. Inside the bag, there is three compartments and small pouches for your smaller objects. It also has two zipped pockets inside the bag. It comes with an adjustable shoulder strap which is 30cm long. This is quite a catch at this price; it’s a sturdy and high-quality bag which you can use for many years to come. If you go for one of the big versions of this bag, it is quite spacious, and you will be able to bring not only a 17” laptop but also multiple books and files. The design is spotless and very traditional, you can also remove the shoulder strap and just carry it around like a briefcase. If you wish to be the Don Draper of the teachers’ lounge, this is the right bag for you. This teacher bag is from Teacher peach which is a brand that focuses on teacher gifts and products. They also feature a lot of different classroom products. Their products are highly appreciated with great reviews and a wide variety that will fulfill your teaching needs. 10% of their profits go to a non-profit fund which focuses on raising emotionally healthy and creative kids. This bag is a beautiful, simple shoulder bag for a new teacher; it is 12” tall, 14” wide and 8” deep. It has a magnetic snap closure which works flawlessly making it easy to unload and load the stuff you are carrying. It also has a zipper pocket inside for items you wish to make more secure. It is high-quality materials and hardware which should stay in good shape for a long time, even if you use it daily. The bottom of the bag is made from leather like material which is sturdy and makes the bag standing on its own “feet” without slouching. 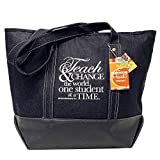 This bag is a great gift for a new teacher, or if you’re just looking for a simple no nonsense bag, it does not offer a lot of organization but a very large spacious bag which easily fits your laptop, books, and lunch. Leathario is a very popular brand on Amazon, they have specialized as the name indicates in leather goods. Often featured on bestseller lists and with great reviews, Leathario is a quality stamp. Many of their products feature a lifetime warranty, and so does this bag. This is a great multifunction bag, which also makes it a great teacher bag. Made from buffed leather and you can get it in four different colors Tan Brown, Dark Brown, Black PU Leather, and regular Black leather. The sewing and materials used on this bag are of excellent quality, and we were very impressed with the craftsmanship, top that with a lifetime warranty, and you might be set for life if you decide to go with this bag. The product dimensions are 17” long, 7” wide and 11” height. The cool thing about this bag is that you can use at as a regular briefcase bag, messenger bag, and the completely classic backpack. It comes with an easily detachable and adjustable shoulder strap. 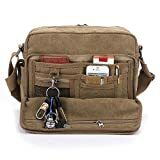 This bag will fit up to a 15” laptop, and it has great opportunities for organization as it comes with a wide variety of zipper pockets on the outside. Inside you will find two main compartments one specifically made for carrying your laptop with you, it has a Velcro strap so you can make sure your laptop doesn’t move around on the go. The other main compartment features a great space for books and files; it also has medium-sized pockets for a tablet or a calculator and pen pockets for your writing material. We have used this bag for a while now, and we are really excited about it. The zippers are of great quality and do not get stuck etc. You can use it for so many different things, gym bag, travel bag, briefcase, backpack, whatever your need Is – this bag can fulfill that role. Easy to access pockets and so many options so you can get neatly organized and prepared! There are many different options as a teacher, the most popular teaching bags are the traditional Tote Bag and a classic messenger bag. We have elaborated under here, why you should go for one of these two types of bags. It is also worth mentioning that it’s a very popular choice to get your teacher bag monogrammed, it’s a nice little detail and the price for the monogramming might be returned to you tenfold if you ever lose your bag. A tote bag has a very classic look as seen below and is usually carried in hand or over the shoulder. It’s a very simple bag that almost always has a zipper pocket on the front and inside you will often see only one main compartment, or in some of the bags, there is a specific padded compartment for laptops. They are often very lightweight, and it’s quite a simple product which you can often get your hands on at a very reasonable price. It is also great for traveling. A messenger bag is also a classic good choice. They are available in all kinds of price ranges and made from wide variety of materials. It’s carried over the shoulder with a strap, so the bag is resting on your lower back. It is quite a popular choice for teachers, and if your commuting on the bike to and from work, we recommend a messenger bag over the tote bag. One of the great things about a messenger bag too is that it’s usually slightly larger than a tote bag and offers more organization. 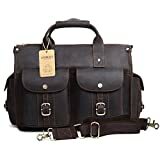 So, if you wish to bring more than just your laptop, books, files and lunch – a messenger bag is worth looking at. Also, a messenger bag like mentioned is available in all sorts of materials and price ranges so that you will have a lot of more options available for you.